Two 20th-century composers, Rachmaninoff and Respighi, who by and large preferred to stay away from the atonal modernism of many of their contemporaries, formed the attractive pairing in this concert of the London Symphony Orchestra (LSO) under Antonio Pappano. The subject was Italy, whether in Rachmaninoff’s tribute to the Italian violin virtuoso Paganini, or in the fascination of Respighi with the Italian capital. French pianist Lise de la Salle replaced at short notice the injured Alice Sara Ott in Rachmaninoff’s Rhapsody on a Theme of Paganini. There was much to admire in her pianism even if ampler rehearsal time would undoubtedly have resulted in a more finished performance. Granted, Pappano didn’t make things easy. By his edgy, incisive and hard-driven yet precise approach he immediately made it clear this was a no prisoners event. It took De la Salle a while to settle the balance with the orchestra (she was drowned out in the opening pages) and make it clear she had something to say as well. Her steely fingers ran with admirable speed and articulation through the faster passages. At best it sounded as if soloist and conductor were sparking each other off, although her playing lacked shading and the power and excitement in the latter half of the piece all too often turned into breathlessness. 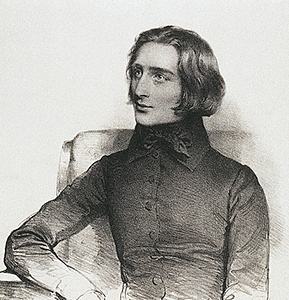 Eventually it were the more introspective variations, where De la Salle’s piano blended with the superb contributions from the LSO soloists, that best demonstrated her musicality. Pappano’s sense of theatre was unfortunately heard at its worst in one of the schmaltziest eruptions in the famous 18th variation I have heard in a long time. Ottorino Respighi’s three symphonic poems about Rome, composed between 1916 and 1928, weren’t meant to be heard in sequence and it takes some adjustment when doing so in order to avoid aural overkill. Maestro Pappano, whose affection for the music is not a secret, announced he would perform the trilogy in a different order than programmed. Instead of the chronological order he opened with Roman Festivals to conclude with Pines of Rome. To be sure, this setup makes for a more balanced evocation and moreover it allows ending the concert with the irresistible Appian Way march. While Pappano’s traversal wasn’t without its weaker moments, the LSO was in stunning form throughout, including superb solos from all desks, a rock-solid ensemble, and a quite astonishing transparency in even the most demanding passages. This is spectacular music, but it takes a spectacularly gifted orchestra to tackle it with such jaw-dropping precision, panache and aplomb. And the LSO offered that in spades. The colorful extravaganzas of Roman society and history were hammered home without any fear of excess or exaggeration by Pappano. Yet this was overall more Fellini’s Rome than Corot’s. Pappano’s heady approach worked best in the Festivals and the Pines of Rome, yet less so in the subtler moments of Fountains. Colors generously splashed all over the Barbican and while Respighi’s aural orgies knocked you out of your seat (as in the Circuses and the Epiphany), eventually I felt Pappano was leaning too much towards a loudness contest, at times sacrificing evocation to the purely demonstrative. The Fountain of the Valle Giulia at Dawn opening the Fountains started too loud and was in spite of the superb strings and winds playing short on atmosphere. Pappano jumped dynamic markings again in the Triton Fountain by having the horn blasts as loud as the following rush of water. Trevi, too, was uniformly loud, without the surging crescendo, but the closing pages of the Villa Medici at Sunset acquired a feel of ravishing serenity. Categories: Concert reviews | Tags: Antonio Pappano, Barbican Centre, Italian music, Lise de la Salle, London concerts, London Symphony Orchestra, LSO, Ottorino Respighi, Pini di Roma, Rhapsody on a Theme of Paganini Op. 43, Roman triptych, Sergei Rachmaninoff | Permalink. It was a packed and enthusiastic Centre for Fine Arts that greeted Sir Antonio Pappano, leading his Roman Orchestra della Santa Cecilia. Their visit guaranteed a notable Italian presence but of course music lovers in Brussels also fondly remember the glory days of the Monnaie Opera when Pappano headed it for some ten years before moving to London’s Royal Opera House in 2002. As it turned out, however, this evening it was Dutch violinist Janine Jansen who quickly became the focal point, delivering the most remarkable performance in an otherwise unremarkable concert. Categories: Concert reviews | Tags: Antonio Pappano, BOZAR, Centre for Fine Arts, Janine Jansen, Orchestra dell'Accademia Nazionale di Santa Cecilia Roma, Paul Dukas, Piotr Ilyitch Tchaikovsky, PSK, Robert Schumann, violin | Permalink. Hyped as a “marriage made in heaven”, Antonio Pappano ushered his Orchestra dell’Accademia Nazionale di Santa Cecilia in Rome out of obscurity into the international spotlight. Guided since 2005 by the busy maestro – who combines his Roman post with that of music director of the Royal Opera House, Covent Garden – Santa Cecilia embarked upon a series of tours, recording at the same time for EMI Classics popular symphonic works from Tchaikovsky, Rachmaninoff, Respighi and Mahler, as well as operas from Rossini and Puccini. Their most recent release bravely pairs two Antonin Dvořák’s warhorses, the 9th Symphony “From the New World” and the Cello Concerto, taped live and assembled from a handful of concerts in Rome in 2011/12. 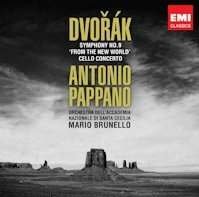 Categories: CD reviews | Tags: Antonin Dvorak, Antonio Pappano, cello, Marc Haegeman, Mario Brunello, Orchestra dell'Accademia Nazionale di Santa Cecilia Roma, Symphony #9 in E Minor Op. 95 "From the New World" | Permalink.